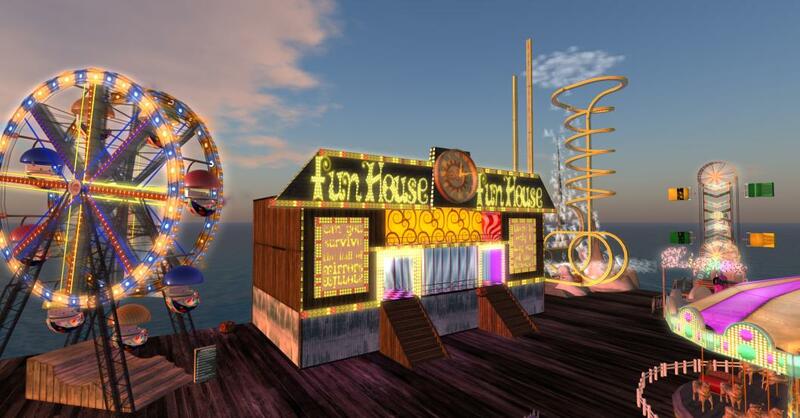 Summer on the Boardwalk, a carnival for Adopt-a-Family, was held this weekend, July 8 – 10, at SnickerDoodle (126, 135, 25). Adopt-a-Family is an organization that helps make holidays a little better for Second Life residents facing economic hardship in their real-life. The carnival was a huge success, raising over $288,000 L for this charity. The festivities included rides, food, live music, auctions, and even a dunk tank. Although the rides could be ridden for free, a convenient ticket box near each one allowed you to donate to the charity. The rides included a Merry-Go-Round, Bumper cars, Ferris Wheel, Jet Scream, and more. I got a great bird’s eye view of the carnival from the Ferris Wheel, but the Jet Scream ride was awesome. It started out tame, but soon was revolving like a rocket. Good thing I rode before I ate the hot dogs and cotton candy. There was a House of Mirrors that looked interesting, too, but I never made it inside. I was distracted by a few fun-loving residents at the dunking tank who were having a great time. Instead of looking in the mirror, I decided to join them. Lacie Beningborough and Laetitia Vella had Ted Floresby right where they wanted him—in the dunk tank. Ted splashed into the tank quite a few times thanks to Lacie’s mean arm! Laetitia and I cheered Lacie on a bit, then I had to give it a try. For a small donation I got 3 balls. I made the last one count—and downed Ted again. He was a good sport and was doing it for a great cause. Lacie Beningborough began Adopt-a-Family in November of 2009, when she discovered that a SL resident was in need in RL. The family was in jeopardy of losing everything because the husband had just lost his job, and the couple had two chronically ill children. 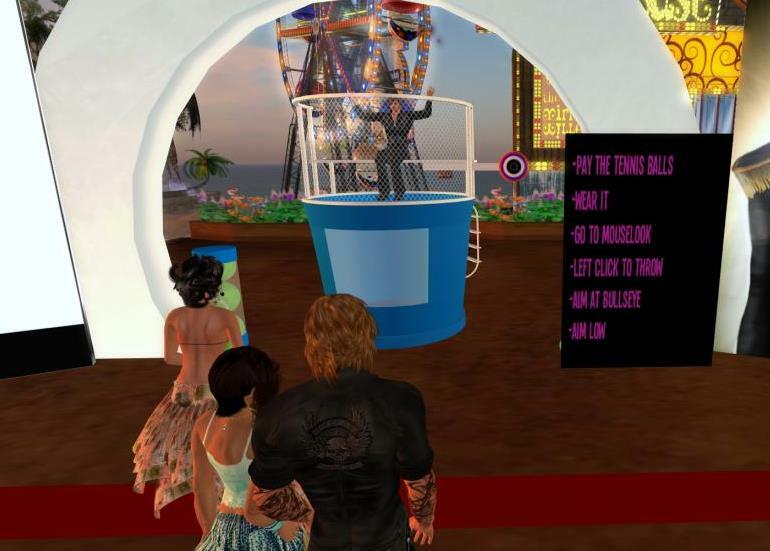 Lacie organized a benefit to help the SL resident. The fundraiser was a huge success, and she promised to have it become a SL tradition. This year’s Christmas show will be December 19, 2011. During the year Adopt-a-Family raises funds to help families in Second Life to have Christmas in real-life. The identity of the recipients is known only to the Board of Directors to protect privacy. Donors have the option of remaining anonymous or allowing their names to be used. If you know a SL resident that will need some help during the holidays, you can contact Lacie Beningborough before November 15, 2011.